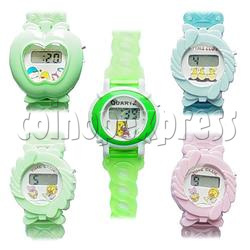 This is a series of children's watches with cute plait watch bands. Special watch case designs like apple, bowknot, oval, laceness, round or fruit. Lively cartoon images on the dials. Many different styles as screen shots include in this series. Many colors are available as screen shots. Minimum order quantity: can choose THREE different colors among 966 pieces. Recommend for children 3 years up. Each piece pack in an individual plastic bag. 23 pieces pack in an inner box, box size: W292 X D257 X H57 (mm). 322 pieces per outer carton, carton size: W500 X D302 X H404 (mm), total 3 cartons for 966 pieces order.